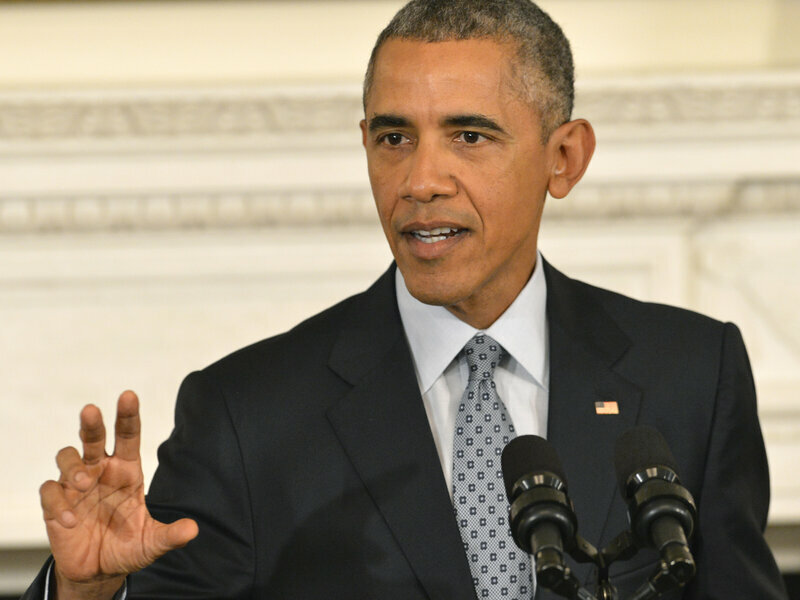 President Barack Obama responds to questions on Russia&apos;s intervention in Syria during a news conference in the State Dining Room of the White House, October 2, 2015, in Washington, D.C. 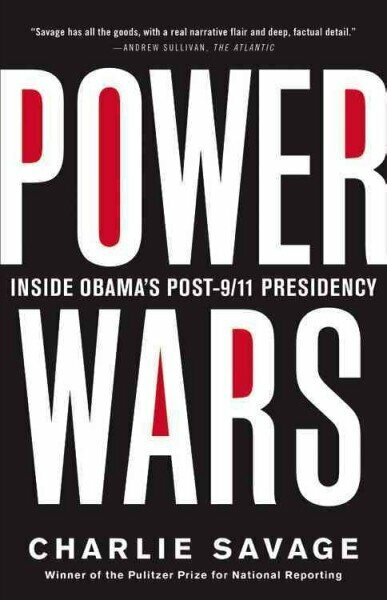 In a pile of books about the Obama presidency, Power Wars: Inside Obama&apos;s Post-9/11 Presidency stands out. Author Charlie Savage provides the most thorough lookyet at how this administration has handled counterterrorism and national security. There are sections on drones, detainees, spying, leak prosecutions and much more. The Pulitzer prize-winning reporter with The New York Times tells NPR&apos;s Ari Shapiro why Obama&apos;s approach to national security differs from his predecessors. "All these years after 9/11, this is still a moment of flux," Savage says. "You know, what are things going to be like later in the 21st century? Is this the new normal? Is this a &apos;forever war&apos;? Obama wanted to get us out of the war in Afghanistan and to sort of declare it over, but events made that impossible." Typically we think of the world as being divided into two types of places — war zones where there&apos;s ground troops engaged in hostilities, and normal countries with functioning governments and police forces, where if there&apos;s a threat emanating from that country, the person can go and be arrested. But especially in the 21st century, in the sort of "War on Terror" era, the world is encountering this problem of badlands — ungoverned, broken states, failed states. Places where there&apos;s neither a normal war happening in any kind of sustained way or a functioning government. And so when al-Qaida or its allies go into those places, the old rules don&apos;t really seem to apply. A lot of the situations the government is encountering now in the sort of post-9/11 world are completely different than what the rules were written for. The rules were developed for 20th century situations — wars between nation-state armies and so forth. And the government is then encountering new problems for which they do not quite map onto very well. And the Bush administration responded to that disconnect by essentially saying "there are no rules": The president as commander-in-chief, can do what he thinks is necessary — whether it&apos;s Geneva Conventions or domestic laws on things like interrogation or surveillance, we can just override those. The Obama administration has taken a very different approach — in part because they are extremely "lawyerly." Bush and Cheney were CEOs by background, not lawyers; Biden and Obama are lawyers, and they put a lot of lawyers into policymaking roles throughout their administration — and so they&apos;re trained to think like lawyers, and they&apos;re exceedingly interested in the law. And so that has led them — when encountering this disconnect between what the rules were written for and the situations arising today — to think about things through a legal lens. All these years after 9/11, this is still a moment of flux. You know, what are things going to be like later in the 21st century? Is this the new normal? Is this a "forever war"? Obama wanted to get us out of the war in Afghanistan and to sort of declare it over, but events made that impossible: The Islamic State arose and now the Taliban is sort of coming back, and we&apos;re sort of getting — staying — sucked in over there. And I think that the next president will have a lot to say about whether this was en route to the ... rolling back of some of this stuff, or was en route to the entrenchment and the normalization and the making permanent of all these post-9/11 policies that have such implications for individual rights and collective security.